When David Mann (author of Creating a Lean Culture) suggested to me to write a book about how Lean could be successfully applied in the office, I was a bit reluctant at first. The scale of the project was daunting. He encouraged me, however, and said if I don’t tell the story of how it was being done in organizations, the story wouldn’t be told. The story begins with wondering if Lean concepts could be transferred from manufacturing and be applied effectively in the office? And could Lean principles be applied to build a culture of continuous improvement in any workplace? It turns out that the transfer of Lean principles from the concrete floors of manufacturing to the carpeted areas of the office required some fresh approaches and counter-intuitive ideas. As the story unfolds, it turns out that Lean does transfer from manufacturing to the office. While the principles of wastes eliminate and flow through a value stream apply, “some translation is required." The wastes in the office value stream are hidden from view and not in plain site as is inventory between machines in the manufacturing. Because of this, wastes must be exposed. Mapping the informational value streams of office work reveals the waste in the system. Once the wastes are in plain view, then work can be done to improve what are typically push systems with pull systems that are more visual. The opportunities for removing wastes from the information value streams in the office can yield dramatic improvements in flow. To build the practice of making these improvements into the culture requires employee involvement with the support of the leaders. The Highly Effective Office describes a road map for the journey of building a Lean culture in the workplace by providing methods to build a workplace that engages both the knowledge worker and the leader in continuous improvement. What do you think of Tim's perspective? Have you applied Lean in the office environment and mapped the value stream? How Do Service Organizations Translate Lean Principles into Sustainable Practices? 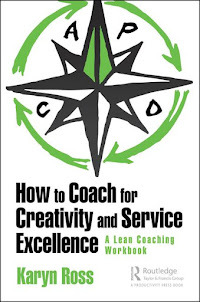 In January, Karyn Ross published a new and very important book entitled How to Coach for Creativity and Service Excellence: A Lean Coaching Workbook -- It is a self-contained workbook, in which the reader completes twenty-one days of practical exercises and activities focused on creativity, Lean, and coaching (one set per day). These exercises enable readers to develop their capability and confidence to be creative, adapt Lean principles, practices and tools to their unique service organization, and coach others to do the same. • Lean is for manufacturing. • Senior leadership doesn’t really support it. • Lean is just another "flavor of the month." “I can’t ask my team for 100% accuracy. It’s demotivating and they can’t do it. Coaching people to use my simple, disciplined, practical approach to PDCA so that anyone, at any level of the organization, can generate creative ideas to overcome those “I can’ts." How to then turn those creative ideas into more effective and efficient ways to work by adapting Lean principles such as flow, leveling, and standard work in services. These factors ensure that customers are satisfied – now and for the long-term -- and the organization will be able to fulfill its purpose. And, whether you’re in services – or manufacturing – that’s exactly what sustainable Lean practices are all about! Do any readers work for service or transactional organizations that are applying Lean principles to achieve excellence? What do you think of Karyn's perspective? In December, Ross Kennedy published a book entitled Understanding, Measuring, and Improving Daily Management: How to Use Effective Daily Management to Drive Significant Process Improvement . This book explains the critical parts of a continuous improvement strategy to achieve operational excellence and where reactive improvement through effective daily management fits in. To achieve operational excellence, organizations need a continuous-improvement strategy that includes reactive improvement to ensure you have effective daily management, stable production, or work plan to minimize fire-fighting caused by unplanned changes and proactive Improvement to take you to your improvement vision of world-class performance. Unfortunately, many organizations get so focused on proactive improvement through capital projects or operational excellence initiatives such as Lean, Six Sigma, or Total Productive Maintenance (TPM), that they lose sight of the importance of reactive improvement and having a stable production or work plan. Reactive improvement develops the capability and discipline within the organization to be able to rapidly recover from an event or incident that stops you from achieving your expected or target performance for the day, shift, or hour and most importantly, your ability to capture the learning and initiate corrective actions so that the event or incident will not re-occur anywhere across the organization. A supportive organization structure to support development of your frontline people so they have ownership and accountability for the performance of their area of responsibility. Effective frontline leaders to ensure everyone else in the leadership structure are not working down a level. Appropriate measures with expected targets that are linked to the site’s key success factors for operations to ensure goal alignment and are relevant for the focused areas. Structured daily review meetings to identify opportunities (problems/incidents) and monitor progress of their solution so they don’t happen again. Visual information centers that visually display daily and trending performance along with monitoring of actions to address problems/issues raised. Frontline problem-solving root cause analysis capability across the site. Rapid sharing of learning capability across shifts, departments and the organization. What do think of Ross's overview of reactive improvement? Do you practice this technique in your company?